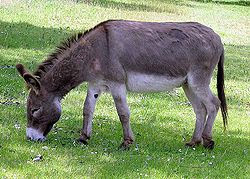 ShiraDrissman.com: Suicide Bombers, Feminists and Donkeys... What do they have in Common? Suicide Bombers, Feminists and Donkeys... What do they have in Common? The Federal government is now warning us once again of possible terrorist plots - surgically implanted bombs. It's really nothing new. I wrote about it in Breasts of Death last year. I guess it'll give the TSA another reason to do body pat-downs. But really what I'm wondering about are the liberal women's organizations. What do they think about using women as suicide bombers? Is it seen as advancement into "man's territory"? Women have been terrorists for many years already (although I wonder what they get in heaven as a reward?). But we hear nothing from the women's groups showing concern for their Muslim sisters. People for the Ethical Treatment of Animals (PETA) seem to care more than women's groups. The president of PETA sent a letter of protest to then PLO President Yasser Arafat when a donkey was used as a suicide bomber - yes, the animal was killed in the attempt. "Your Excellency, We have received many calls and letters from people shocked at the bombing. If you have the opportunity, will you please add to your burdens my request that you appeal to all those who listen to you to leave the animals out of the conflict?" Of course all these issues in the Arab world are certainly not being addressed - and I haven't heard a peep about supporting the newly freed Iraqi and Afghanistani women who could use a bit of support from these feminists. So as we listen to the TSA explain how they're going to "touch our junk" I think to myself and wonder why liberal women's groups care less about their Muslim sisters than PETA cares about a lone donkey. Wind farm invades Normandy Beach? Happy Belated Canada Day! July 1st!